“Just before Halloween, I thought it only fitting to tell you about a wonderfully written and fun— albeit somewhat scary—new novel by local author Scott A. Lerner…. The three best things about this novel are its fast pace with short chapters, Sam as the likable hero and the humor. ‘I wanted to write a book I would also like to read,’ Lerner said. ‘The characters would talk and act like real people. It would be realistic, but at the same time, larger than life. I didn’t want it to follow the same old tired formula.’ He succeeded.” Read more …. Samuel Roberts, a small-town lawyer in Urbana, Illinois, is contacted by a prospective client accused of selling cocaine. Nothing Sam hasn’t handled before. Or is it? Thomas is accompanied by a mysterious and exotic beauty named Chloe. Who is she, why is she paying for Thomas’s defense, and why is the accused so antsy around her? Soon after Sam takes on the case he is plagued by terrible nightmares. Only, in these nightmares, when he dreams of death, people die. Realizing that he is out of his depth, Sam enlists the help of his friend, Bob Sizemore. Bob is oddly insightful about the supernatural and deeply suspicious of big business and the government. Sam and Bob soon discover that a major German pharmaceutical company has been using human guinea pigs to test a highly addictive and dangerous derivative of cocaine first developed in Nazi Germany. Combined with ancient herbs provided by a Voodoo priest, the substance has become increasingly addictive and dangerous. After Thomas’s head shows up in Sam’s refrigerator, suspicion naturally falls on him. Now he has no choice but to face the forces of evil head on. But how do a small-town lawyer and a computer geek defeat an enemy with the power to enslave mankind? Author and attorney Scott A. Lerner resides in Champaign, Illinois. He obtained his undergraduate degree in psychology from the University of Wisconsin in Madison and went on to obtain his Juris Doctor degree from the University of Illinois in Urbana Champaign. He is currently a sole practitioner in Champaign, Illinois. The majority of his law practice focuses on the fields of Criminal law and Family Law. Mr. Lerner lives with his wife, their two children, and their cat Fern. Lerner collects unusual antiques and enjoys gardening, traveling, reading fiction and going to the movies. 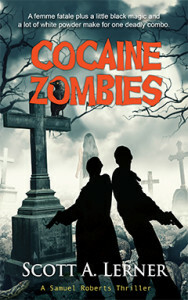 Cocaine Zombies is his first published novel. Coming soon, the sequel: Ruler of Demons. Click here to find Scott online. The house reeked with the metallic odor of blood mixed with urine, sweat and rotten meat. I fought back the urge to vomit. From the rafters I could see the hanging carcass of a headless goat. Below it was a large copper cauldron to catch the blood. The contents of the cauldron were moving, and I involuntarily shuddered when I realized the small ripples were caused by maggots. The head of the goat was gone and a large butcher’s saw lay on the floor. Mercifully the entrails of the goat had also been removed. Everywhere I heard the soft hum of flies. Hanging on the back wall was an African mask. It looked ancient. It was carved from a single piece of dark black wood. The face was half animal, half human. On either side of the mask two large wooden snakes were crawling. A slit had been cut in the wood for each eye and another for the mouth. The wood was dull and covered with a thin layer of dirt. The teeth in the visage were sharp and pointed. It lacked the friendly decorative look one finds at the local Pier One Imports. This mask was intended solely for ceremonial use. In the far corner nearest the kitchen door stood a statue of The Virgin Mary. It was white plaster, the type one would expect to find as a lawn ornament in Mexico City. Next to the statue was a porcelain dinner plate containing a bloody piece of meat. I guessed it was the heart of a small animal, but I wasn’t going to get close enough to check. The entire room was bordered by candles, which provided the only light other than from the windows. Blood was everywhere. Footprints painted the floor with various shades of red. Some were small enough to have been made by a child; others might have belonged to Thomas. It looked as though twenty people had been dancing in a large circle. The only furniture was three plain wooden chairs, one of which was broken, and a small table with a dirty towel for a tablecloth. On the table was a crucifix, a few old square-cut nails and a wooden bowl half-filled with shotgun shells. “You don’t have a bathroom by any chance?” I asked, breaking the awkward silence. “No,” he said, putting the shotgun down. He must have noted the relief on my face. “You know, it’s illegal to own a gun with a felony conviction,” I said. He went through a door and returned with two bottles of cold beer. He must have had a cooler; I was sure this house didn’t have electricity. I took a beer, even though the thought of ingesting anything from this house made my skin crawl. I tried not to laugh when I noticed it was a Dixie Blackened Voodoo Lager. “The chemist in Springfield can’t identify the substance,” I said. “Well, maybe she can identify who the maker is?” I offered. “There are worse things than jail. Some worse than death. I will find out soon and firsthand. I suspect, so will you,” he said, ignoring the question. “Do you think I care? Unlike you I know who and what we are dealing with. That knowledge provides no comfort, only terror.” Thomas’s voice was trembling. I did as I was told. I had more questions, but when he picked up the shotgun again I could tell I was being dismissed. I put down my beer and got up. As I headed for my car, I knew I wouldn’t see Thomas again.